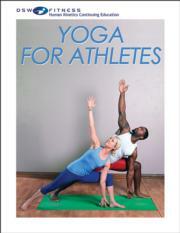 Yoga for Athletes offers instruction on improving strength, flexibility, and balance in any sport or activity. Learn effective poses, guided visualization, and breathing techniques that will elevate sport performance. Describe the benefits of making yoga practice part of an athlete’s training program to improve overall sport performance, and select the proper yoga poses based on the specific sport participation. Understand which muscles are involved in stretching with each yoga pose. Describe preliminary warm-up poses, full-body poses, and a proper cool-down. Select the correct props to maintain proper form during yoga poses and demonstrate proper breathing techniques. Explain why the performance of core exercises in yoga practice can help prevent injury and enhance coordination. Understand the importance of meditation and visualization for athletes as a part of their yoga practice. Choose proper balance poses for improved strength and flexibility in the lower legs.